The 2017 ICD-10-CM Professional for Hospitals featuring our hallmark color-coding and symbols related to ICD-10 MS-DRG reimbursement edits makes facing the challenges of accurate diagnosis coding easier. 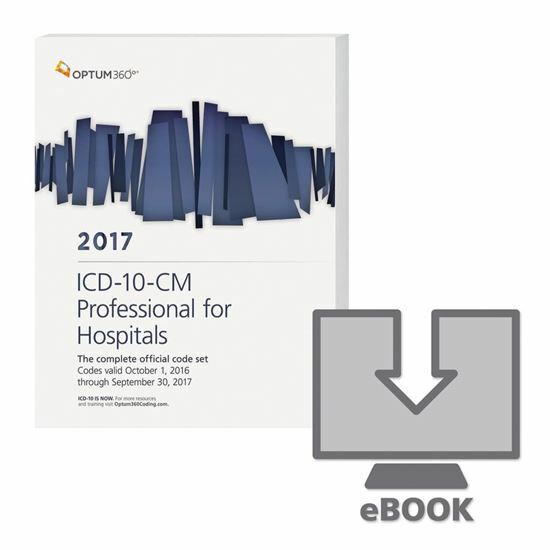 The hospital edition contains ICD-10 MS-DRG edits with symbols for comorbidities/complications (CC), major comorbidities/complications (MCC), and principal diagnoses that function as their own CC/MCC as well as CC/MCC exclusion lists at the code level. Use the code book that contains the complete ICD-10-CM code set, plus all the familiar coding and reimbursement alerts you rely upon. Set the standard for coding accuracy, the cornerstone of healthcare analytics and revenue cycle management, with the confidence only an Optum360 product can deliver. New — Optum360 Edge — Illustrations and definitions in the tabular.Assign codes with confidence based on illustrations and definitions designed to highlight key components of the disease process or injury. • Optum360 Edge — Coding guideline explanations and examples. Detailed explanations and examples related to application of the ICD-10-CM chapter guidelines are provided at the beginning of each chapter in the tabular section. • Optum360 Edge — Placeholder X. This icon, designed and used exclusively by Optum360, alerts the coder to an ICD-10-CM convention — the use of a “placeholder X” for 3, 4, and 5 character codes requiring a 7th character extension.